The voltages used are lethal. Know the limits of your abilities and do not proceed if you are unsure. The 3 wire system was developed to give 2 available single phase voltages by using only 3 wires. The way it does this is to use a transformer on the power pole that uses a single secondary winding with a center tap that is called the neutral. The voltage between the 2 ends of the winding will be 240 or 208 volts. This voltage is used for larger loads such as air conditioners. Because the voltage is higher, wire size can be smaller to give the same power. The voltage to the neutral will be 120 volts. This voltage is considered safer than 240 volts so it is used for smaller appliances that may be plug in. 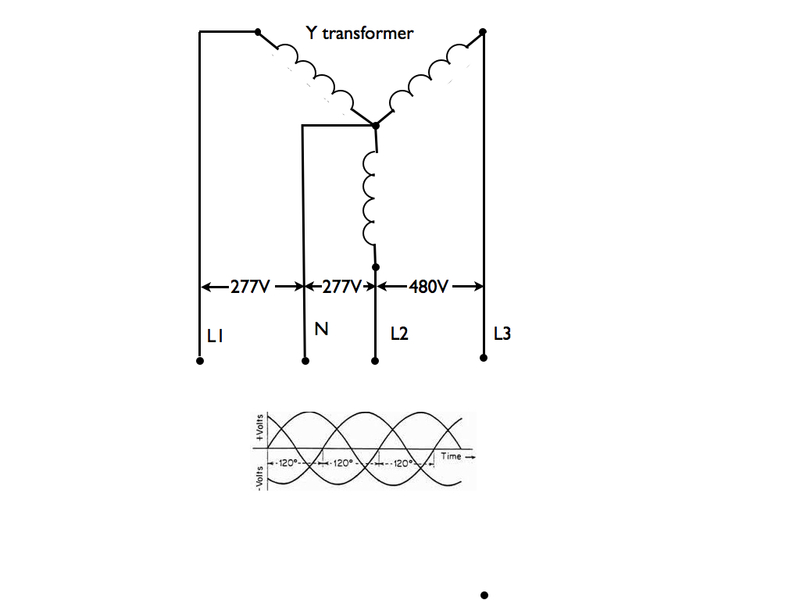 The image on the left gives a schematic of the 3 wire transformer. Probably the most misunderstood part of the 3 wire electrical system is the relationship between neutral and earth ground. 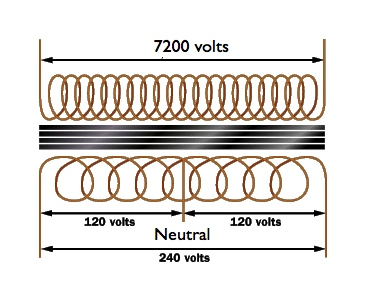 The neutral is a center point on the secondary winding of the transformer on the pole. Because it is the center point, it is zero potential voltage. As the video below explains, the neutral and earth ground are connected together at the main panel. However, if you have a load, let's say a toaster in the circuit, the neutral will not be connected to chassis or earth ground. The metal chassis of the toaster is connected to the safety ground which connects back to the main panel to the neutral. So, if there were a short in the toaster where the hot lead shorted to the chassis of the toaster, the power would pass through the chassis to the neutral in the panel causing an overload which would open the circuit protection. If the chassis ground was not there and the short occurred, the chassis would be "hot" and if you touched the toaster, and were in contact with any other grounded device (metal sink, stove, etc), you would become part of the circuit and would get a shock. The following videos cover what the earth ground is and what it is capable of. The misconception is that earth ground is a power conductor for most 120 volt and 240 volt circuits. These videos test the conductivity of earth ground. One of the issues with earth ground is whether a dead short to earth ground will have enough amperage draw to open the circuit protection and thus protect from electrocution hazard. An example of this would be touching an electrified wire with one hand while standing in a wet location. The power would have to travel from the electrified wire through your body and through the wet ground back to the neutral in the panel. The video below demonstrates the breaker would not trip and open the circuit to prevent the electrocution.